YellowAirplane.com: Russian MiG 23 Flogger Aircraft, MiG Fighter Jets, Models, Books, Videos, Software. Russian MiG 23 Flogger Aircraft, MiG Fighter Jets, Models, Books, Videos, Software. Russian Fighter Jets and Fighter Jet Photos. The "Mikoyan OKB", was founded in 1939 on Leningradskiy Shassi (highway) with a series of buildings and a small factory for use in building prototypes. The OKB was at first, as the title implies, strictly an R&D facility that built prototypes. The Mikoyan flight test center is located at Zhukovskiy (called Ramenskoye, or abbreviated "RAM" by western intelligence and used in the intelligence designation of new aircraft such as "RAM-K", "RAM-J", etc.) and at Volga, on the Crimean peninsula, and other facilities on a temporary basis. The MIG-23 was a Soviet designed fighter-bomber that utilized an innovative swing-wing design for improved performance. First flown in 1967, the MIG-23 NATO code name Flogger was used extensively by the Soviet Air Force and (East) German Air Force (DDR) and the air forces of several Middle Eastern nations. 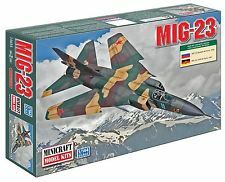 The Minicraft MIG-23 offers new markings for both Soviet and German (DDR) MIG-23. The kit features poseable variable wing sweep and positionable landing gear. There has always been the question of why did the US intell organizations recognize Ramenskoye as the name of the test facility when the Russians have always addressed it as Zhukovskiy. When the facility first opened the town of Ramenskoye was the nearest population center. There was a worker's construction camp, named Zhukovskiy, that eventually grew into a larger town and became the nearest population center and official Russian name for the facility. Peck. Written by the original "Red Eagle," Col. Gaillard R. Peck, Jr., this book examines the recently declassified Constant Peg project. You'll learn how Peck, unsatisfied with the USAF fighter training programs of the 1960s and '70s, established the 4477th Test and Evaluation Squadron in 1980 to train U.S. pilots by having them conduct air-to-air combat exercises against USAF-acquired MiGs. 352 pages, 6"x 9", hardcover. In the Cockpit - DVD Documentary Video. Witness the powerful air capability of the Soviet Air Force in full-color action! You'll view the MiG-29 and Su-27; soar with the MiG-25 Foxbat, MiG-27 Flogger D and the Tu-95 Bear; and go to sea with the Soviet fleet to witness the vertical takeoff of the Yak-36 Forger as it deploys from a Kiev-class carrier. You'll even fly with the latest attack helicopters in spectacular all-arms exercises and Mi-24 Hind and Mi-26 Halo helicopters in combat. Gordon & Dexter. This detailed history covers the development and operation of the Soviet MiG-23 "Flogger," a fast interceptor designed to answer the threat of NATO bombers and spy planes. You'll read of improvements over its MiG-21 predecessor, including its advanced swing-wing configuration; of exports to air forces in the Middle East, the Far East, Cuba and Eastern Europe; and even of the MiG-27, a tactical strike aircraft with a redesigned forward fuselage. 176 pages, 280 B&W and 16 pages of color photographs, 8"x 11", softcover. Pre Built Die Cast Model Airplane. This highly detailed, small-scale die cast model represents the great military aircraft from the 20th century. Model is fully painted and includes embossed stand that also notes the scale. Wingspan measures between 4½" to 8" because of the Swing Wing. An Israeli F-16 Falcon pursues a Syrian MiG-23 over the Bekaa Valley in June of 1981 when, in a three-day period, the Israeli pilots shot down more than 80 Syrian aircraft without a loss. Limited edition 24"x 20" numbered print is signed by the artist. An Israeli Air Force F-15 Eagle is in hot pursuit of a Syrian Air Force MiG-23 in June 1982, when the skies over southern Lebanon saw the most massive dogfights since the end of World War II. The IAF claimed 85 aerial victories and lost only three aircraft - all to ground fire - during its Operation Peace for Galilee. 30"x 21" limited edition print is signed and numbered by the artist.